Lifestream Bioactive Spirulina contains a concentration of nutrients including protein, chlorophyll and unique phytonutrients. Spirulina is a vegetarian source of naturally occurring iron. Iron contributes to a normal function of the immune system and cognitive function. Spirulina is a microscopic fresh water plant, which may be a way to maintain your well being and energy levels. Lifestream Bioactive Spirulina is a superior strain. Hand picked for its purity and nutritional potency from 35 varieties worldwide. Spirulina is ecologically grown, it is free of herbicides, pesticides, GM free and substitute for vegetarians and vegans. High biological value protein - Spirulina contains more protein than any other natural food more than meat and fish (15-25%), soya beans (35%), dried milk (35%), peanuts (25%), eggs (12%), grains (8-14%) or whole milk (3%). All eight essential amino acids - and ten non-essential amino acids – in terms of nutritional profile, spirulina is the closest thing to mother’s milk. High Iron, Calcium and mineral content - Iron & Calcium for healthy blood, bones, nerves and muscles. Spirulina is nature’s richest wholefood source of Biochelated Iron, which is completely non-toxic. 58 times richer than raw spinach and 28 times richer than raw beef liver. Gamma Linolenic Acid (GLA) - an essential fatty acid thought to help combat heart disease, arthritis and the symptoms of ageing. Spirulina contains more GLA than Evening Primrose Oil. Natural Carotenes & Antioxidants - helping to maintain skin and hair and general well-being. Spirulina contains every natural antioxidant known; the antioxidant vitamins B-1 and B-6; the minerals zinc, manganese and copper, the amino acid methionine; and the super-antioxidants betacarotene (25 times richer than raw carrots), vitamin E and trace element selenium. Wide spectrum of vitamins - including natural vitamin E for promoting normal red cell formation and vitamins B-12, B-2 and B-6 to aid absorption, release energy from food, and enhance brain function. Low fat content - proper balanced nutrition reduces the body’s craving for food. Coupled with virtually no fat, spirulina may be a great addition to any weight loss programme. Optimum supplementation: 3 teaspoons daily or more as advised. (Spirulina can be taken all at once or with each meal). Basic smoothie recipe for 1: Add 1 cup of tropical fruit juice, 1 teaspoon spirulina, 1/2 of a banana and blend until smooth. Or simply shake spirulina and juice together. Discontinue use if adverse reaction occur. Below are reviews of Lifestream Bioactive Spirulina Powder - 500g by bodykind customers. If you have tried this product we'd love to hear what you think so please leave a review. 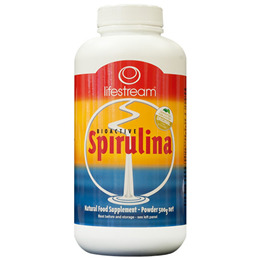 Have been using LifeStream Spirulina for decades. Quality product and Lifestream are reliable suppliers with good prices. Question about Lifestream Bioactive Spirulina Powder - 500g What is the difference between Spirulina and Blue Green Algae? Question about Lifestream Bioactive Spirulina Powder - 500g How should I take this? Question about Lifestream Bioactive Spirulina Powder - 200g What is the difference between Spirulina and Blue Green Algae? Question about Lifestream Bioactive Spirulina Powder - 200g How should I take this? Lifestream Bioactive Spirulina contains a concentration of nutrients including protein, chlorophyll and unique phytonutrients. Spirulina is a vegetarian source of naturally occurring iron.